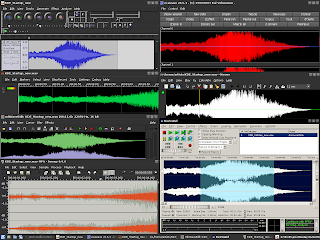 ArtistX 0.5 - A Complete Multimedia Studio on a Live DVD - Create music and edit videos right from the Live DVD ArtistX 0.5, a Debian-based Live DVD Linux distribution, was announced a few days ago by Marco Ghirlanda. This distro is full of applications for audio, video and graphics creation & editing. It uses the Linux kernel 2.6.25, KDE 3.5 as desktop manager and, as a bonus, you get Compiz 0.7.7 (from Debian unstable) for more eye-candy. As there's no need to install it on your system, you have a complete multimedia production studio right from the DVD. For 2D graphic editing you have Gimp, Inkscape, Nip2, Krita, Cinepaint, Rawstudio and more. If you want to create 3D animations, you can use Blender, Wings3D or K3D as they are included on the Live DVD too and are accompanied by some other great applications. Cinellera and Kino, two of the most popular video editing tools from the open source world are included in ArtistX 0.5 along with Kdenlive, Pitivi, Avidemux, Devede, Openmovieeditor and many more. If you just want to watch a movie or listen to music, you have a large number of multimedia players available, like Mplayer, Helix Player, Xine, Kaffeine and Kmplayer. Download ArtistX right now from Softpedia. i havent tried this distro yet but some of the popular linux distros do this also.